Facebook Messenger is the regular Facebook app's cooler cousin. It may not always know which look is fashionable, but it isn't afraid to experiment and adapt. If the app doesn't come out looking sharp the first time, it has no problem with returning back to the store, spending some time in the dressing room, and coming out with something different. For a few months now, we've watched Facebook experiment with giving its texting app a few Material-inspired changes. The designers added in a blue floating action button (FAB) that starts new conversations. Later changes turned the action bar blue. This experimentation has all taken place server-side, so there's been no way to trigger them manually or know for certain if they would stick around. Well, today Facebook's Vice President of Messaging Products David Marcus announced the new look for the company's Android app. That makes the changes official. The tweaks to the interface are rolling out now, with some of you possibly already having the updated experience. 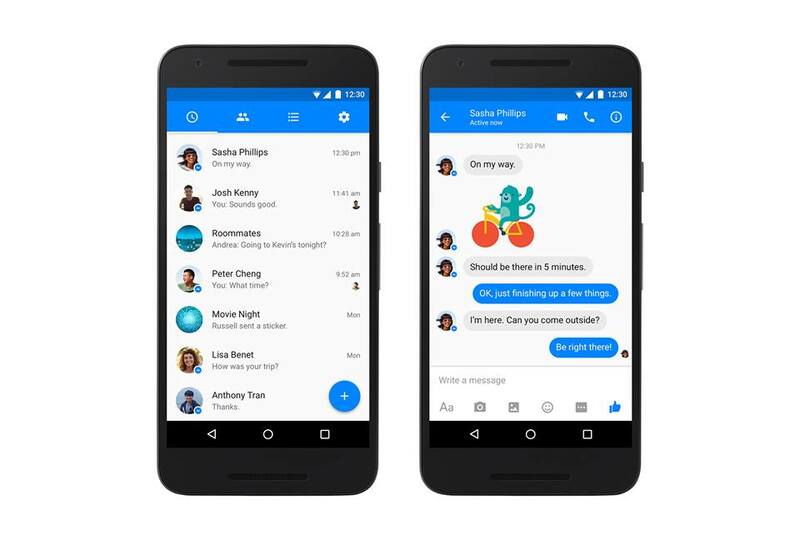 Facebook Messenger's updated interface comes shortly after developers introduced multiple account management. Other, less pleasant changes may be in the cards for later this year, such as the introduction of ads. Facebook's business decisions could ultimately have more impact over whether users stick with the app than interface integration, but on the other hand, at least you wouldn't be dealing with both intrusive ads and an intrusive design.